Government will expect an element of co-funding, either on a project basis or to delivery a local area’s wider strategy for the high street. This co-funding could either be public (e.g. from local areas’ own budgets) or private finance (e.g. co-financing housing infrastructure). The Fund will contribute up to a maximum of £25 million to each successful place. However, they expect to see a range of project sizes coming forward, many of which are in the region of £5-10 million per town centre. Local authorities are recognised as best-placed to bid for the funding and develop and deliver proposals. Government expect bidding local authorities to put forward a single, transformative submission covering one high street or town centre in their area. This may comprise of more than one intervention, but that will need to be subject to a strong business case. For example, a local authority may wish to consolidate its town centre offer across a number of high streets to provide additional residential or commercial space. In that case government would consider applications which saw interventions across the network of high streets assuming there was a sufficiently robust strategic business case. The deadline for submission of expressions of interest is 22 March 2019. The Ministry of Housing, Communities and Local Government (MHCLG) invites applications from communities to apply for funding to support them with establishing new pocket parks, creating safe and usable green spaces, and for helping to restore and renovate existing parks which have fallen into disrepair, bringing them back into public use. They seek applications from communities that can provide evidence of a local need that can be addressed through the creation or refurbishment of a park. The scheme provides grants to community-led bodies working in partnership with their local authority with the aim of creating new pocket parks or bringing existing green spaces up to a safe, usable standard and ensuring long-term support for those initiatives. For the purposes of this scheme a pocket park is defined as a piece of land of up to 0.4 hectares (although many are around 0.02 hectares, the size of a tennis court) which may already be under grass, but which is unused, undeveloped or derelict. £1 million has been allocated to this programme in 2018-19. They expect to allocate grants of up to £15,000 for new pocket parks and £25,000 for refurbishment of existing parks split between capital and revenue. Grants will be paid to the appropriate principal local authority that is supporting the application. The deadline for applications is 25 January 2019. Applications are invited from existing schemes to trial a new approach to helping children and young people with their mental health. Through this programme, the Department of Health and Social Care, NHS England and Public Health England are working with VCSE organisations to promote equality, address health inequalities and support the wellbeing of people, families and communities. Up to £510,000 is available per applicant over a 3 year period. The deadline for applications is midday on Friday 15 February 2019. Interest free loans are available for enterprising ideas to improve community spaces. Places and spaces for people to come together and enjoy shared interests are vitally important for building stronger communities. Venues such as parks and community centres need regular income so they can continue to meet the needs of people who use them, love them, and rely on them for local services and social contact. Interest-free loans of up to £50,000 towards viable business ideas that will benefit the whole community – particularly those facing greater challenges. EU citizens living in the UK and their family members will need to apply under the EU Settlement Scheme (EUSS) to obtain their new UK immigration status as the UK exits the EU. The deadline for submissions is 1 February 2019. First Steps Enterprise Fund (FSEF) is a £300,000 pilot fund to support community organisations. The Social Investment Business manage this fund on behalf of the Asda Foundation. Funding packages of up to £30,000 are available (90% loan and 10% grant). The loan element is charged at 5% (fixed) to be repaid over a period of 4 years with an optional capital holiday for the first year. Up to £50,000 is available for exceptional cases. The Smallwood Trust have received funds from the Tampon Tax Fund to provide grants to projects which enable women on low incomes to access new skills, training, confidence building and employment opportunities. Tampon Tax funding is matched with Smallwood Trust funding. The objective of the fund is to identify and document good practice that is achieving outcomes for women on low incomes by building their skills, confidence and aspirations to enable them to enter into employment. They will fund existing projects and ongoing work. Projects should be proven and able to evidence impact and good practice. This includes interventions that are not currently documented extensively or are being implemented in a new context. The deadline for applications is 4 March 2019. They offer grants of up to £5,000 for projects that will provide an on-going service for local communities. Whether you want to support a youth club or start a class for older members of your community, the fund is there to help. Rural communities with projects off the mains gas grid can submit their projects for funding. The projects that receive the most votes will be shortlisted and then reviewed by a panel of judges, who will select the winning projects for funding. The fund will open for project submissions on 20 March and close on 21 May 2019. Interested groups should register their details on the fund website to receive updates. Cornerstone grants. The Cornerstone Grant Programme offers grants of between £10,000 and £50,000 towards the cost of urgent structural repair projects costed at more than £100,000 including VAT. The Trust will also consider projects that introduce kitchens and accessible toilets to enable increased community use, costed at more than £30,000 including VAT. Grants will never exceed 50% of the project cost. The next deadline for applications is 4 March 2019. Gateway grants. The Gateway Grant Programme offers grants of between £3,000 and £10,000 towards project development and investigative work up to RIBA planning stage 1, to support churches preparing for a major project, and in developing their project to the point at which they can approach a major grant funder. Grants will never exceed 50% of the project costs for this phase. The next deadline for applications is 10 January 2019. Foundation grants. The Foundation Grant Programme will offer grants of between £500 and £3,000 towards urgent maintenance works and small repairs identified as high priority within a recent Quinquennial Inspection or Survey Report. Also, small investigative works and surveys. Project costs should not exceed £10,000. The next deadline for applications is 24 January 2019. The vision for Creative People and Places is to support the public in shaping local arts and cultural provision and, in so doing, to increase attendance and participation in excellent art and culture. This investment is intended to encourage long-term collaborations between local communities, arts organisations, museums, libraries, amateur groups, the voluntary sector and others. It aims to support new and different approaches to developing cultural programmes that deliver excellent experiences, genuinely engage people in shaping provision and involve a variety of partners. The Arts Council will invest in consortia in eligible places to develop a programme of cultural activity and engagement over four years but with a 10-year vision. New programmes can apply for between £1 million and £2 million over four years whilst expansion programmes can apply for between £750,000 and £1.75 million over the same period. The programme will open for applications on 10 January 2019. The deadline for applications is 21 March 2019. Thousands of women and girls across the country are set to benefit from a new £15 million round of the Tampon Tax Fund, launched at the end of November by the Minister for Sport and Civil Society, Mims Davies. Charities across the country can now bid for at least £1 million in funding for projects that support victims of domestic violence or work to reduce rough sleeping and homelessness among women. The money will also be available to programmes that help vulnerable women through music therapy, encourage them to participate in sport to improve their physical and mental wellbeing or charities that make onward grants to smaller organisations, so they can deliver tailored services to support women. Energy Saving Trust has been appointed by Ofgem to distribute payments from energy companies who may have breached rules. The funds can pay for anything from making a home more energy efficient, to providing advice that helps consumers keep on top of their bills. Energy Saving Trust has developed an open application process for charities seeking funding from the Energy Redress Scheme. Successful projects will be selected with input from an independent panel of experts and could cover a range of locations across England, Scotland and Wales. 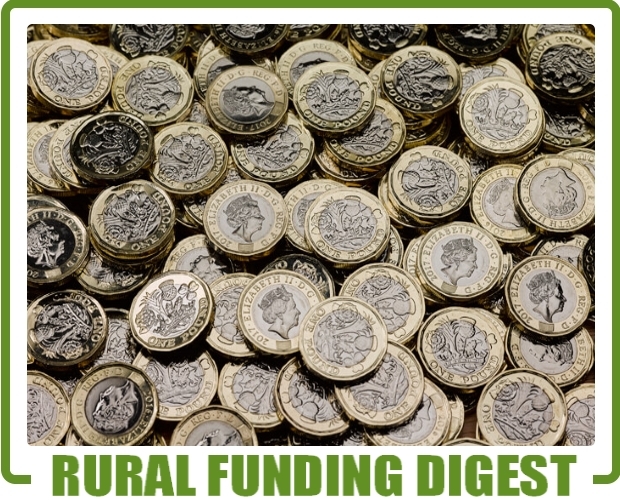 The amount of funding available through the scheme varies throughout the year and will be reviewed on a quarterly basis in October, January, April and July. Eligible charities that have registered interest in the scheme will be notified when funds become available. The minimum grant that can be requested is £20,000 and the maximum amount is the lesser of £2 million or the total value of the current fund. The scheme can fund projects lasting up to two years, can fund 100 per cent of the project cost and can cover revenue and capital measures. The Community Pub Business Support Programme is a unique three year programme established to help support community ownership of pubs in England. Its value is £3.85 million and is jointly funded by the Ministry of Housing, Communities and Local Government and Power to Change. Plunkett Foundation is leading this exciting programme and delivering it in collaboration with Co-operative & Community Finance, Keyfund, the Campaign for Real Ale (CAMRA), Co-operative Mutual Solutions, Pub is the Hub and Locality. For the first time it offers the community pub sector access to an end-to-end support programme including capacity building and a finance package made up of loans and grants. The Nationwide Gigabit Broadband Voucher Scheme (GBVS), announced on 15 March 2018, will provide vouchers worth up to £2500 for a small or medium sized business or £500 to residents to help with the costs of connecting to full fibre broadband. In November 2018 the maximum amount claimed for a business voucher was reduced from £3,000 to £2,500 to make sure that the scheme reaches even more people with full fibre connectivity. The Main Grants programme is open to charities and not-for-profit organisations applying for grants over £10,000 per year for up to three years. Projects are funded which make differences in children’s lives that help prevent or overcome the effects of the disadvantages they face. Projects can achieve these differences by either working directly with children or seeking to improve their social and physical environments. The next deadlines for applications are 13 January and 19 May 2019. The government is making available £163 million across England up to 2020 to 2021 through the Community Housing Fund. The Fund aims to support an increase in housing supply in England by increasing the number of additional homes delivered by the community-led housing sector; to provide housing that is affordable at local income levels and remains so in perpetuity; and to deliver a lasting legacy for the community-led housing sector in the form of an effective and financially self-sustaining body of expertise within the house building industry in England. Under Phase Two of the Fund Homes England is making available grants to eligible organisations to help cover the capital costs of acquiring land and building community-led housing schemes. Both phases are now open. This £3.7 million fund provides small-scale repayable finance to socially-driven arts and cultural organisations. The Fund is supported by Access – The Foundation for Social Investment through the Growth Fund programme, with finance being provided by its partners Big Lottery Fund and Big Society Capital. Increase the capability of arts and cultural organisations to articulate, achieve, monitor and evaluate their intended social impact. The Fund offers unsecured loans (and revenue participation agreements, where appropriate) between £25,000 and £150,000 with repayment terms of one to five years and interest rates ranging between 5.5% and 8.5%. The investment window is open until August 2021. Thanks to a series of generous donations the AIA can make available Restoration Grants of up to £20,000 for a range of historic and industrial archaeology purposes. The first awards were made in 2009, since when the Association has been able to allocate around half a million pounds. Details of some of the projects funded can be found on the website. Grants are awarded for the restoration of historically, technically, architecturally, and/or archaeologically important industrial buildings, structures, machinery, vehicles and vessels within the UK. Applications will usually relate to a single, tangible structure or artefact. The closing date for applications is 31 March 2019. This fund will have a value of £15 million per annum with the anticipated size of bids between £1000 and £150,000. There is no deadline to apply. Funding of up to £25,000 is available and the programme will open again to applications on 7 January 2019. The scheme will close to applications on 31 March 2019. The scheme will close earlier if the current funds have been distributed. Up to 50% funding is available to projects and the initiative is due to run for 10 years with 2 funding rounds each year. 'Archives Revealed' is a partnership programme between The National Archives and The Pilgrim Trust. It is described as the only funding stream available in the UK dedicated to cataloguing and unlocking archives. The fund is comprised of two funding strands, the first of which, ‘Cataloguing grants’ of up to £40,000 for archives to create catalogues of important archival collections, re-opened for applications in October with a deadline of 7 December 2018. The deadline for a second phase of applications will be 8 April 2019. The deadline for applications for both Project Viability Grants and Project Development Grants of up to £7,500 is the last day of each calendar month. Project Development Grant applications for more than £7,500 go to Trustee Grants Panel meetings for decision. The deadline for the next meeting is 11 February 2019. Projects can be supported that make physical improvements at sites located in any of 100 funding zones around qualifying sites owned by SUEZ Recycling and Recovery UK. Bags of Help is Tesco’s local community grant scheme where the money raised by the carrier bag charge in Tesco stores is being used to fund thousands of community projects across the UK*. The projects must meet the criteria of bringing benefits to the community. In England the scheme is administered by Groubdwork. Bags of Help is always open for applications from charities and community organisations. Applications are assessed by Groundwork to ensure they are eligible. In areas where application numbers are high, Tesco colleagues will shortlist the projects to determine which go forward to the customer vote. Three community projects in each local area will be voted on by customers in Tesco stores throughout the UK, with projects changing every other month. Following the vote, the project that received the most votes in its area will receive a grant of up to £4,000, second place receiving up to £2,000 and third place up to £1,000. HLF will be opening a new funding portfolio in late January 2019. For information on all HLF programmes visit the website. Following a review, Government is looking into future arrangements for the Rural Community Energy Fund. They are currently not accepting new applications.